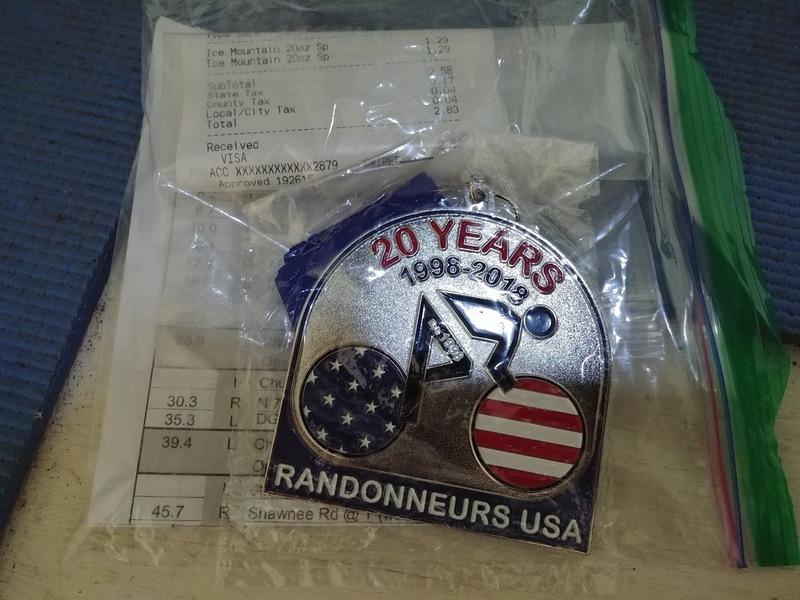 Randonneuring is all about pushing one's limits and exploring far-off places... and a lot of our local randonneurs have made very good on those goals this year - as they do each year. One such event was the recent Mac-&-Cheese 1,200km, which takes place in Michigan and Wisconsin -- more information on this event can be found here. Gary D., whom I've been lucky enough to share a fair number of miles with, put together this particularly good tale from his experience, and I asked for his permission to re-post it here with his photos. 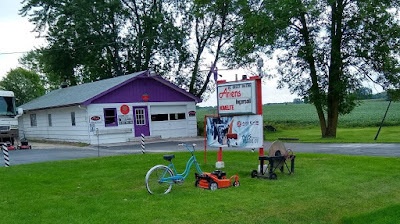 Please enjoy this sweeping tale of lucky stones, mythically-large cinnamon rolls, and bike mowers! 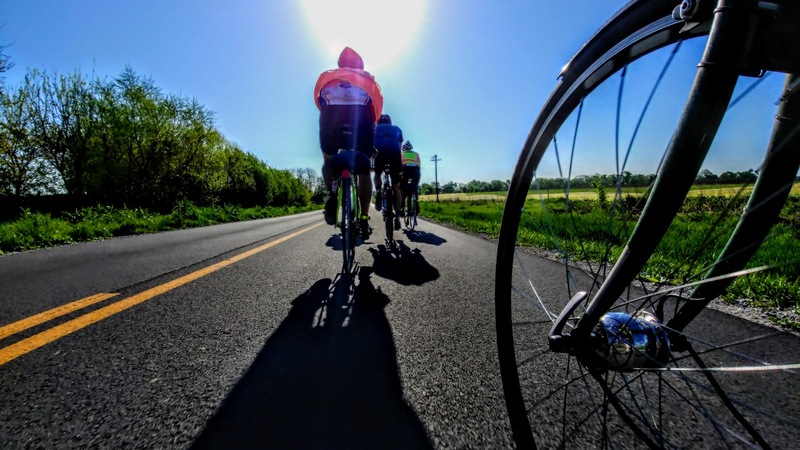 The Mac and Cheese 1,200k is done, and we’re left with stories, memories, and new friends. I took a few pics for the FB page, with some summary, and pasted them into the document below. We had a few hiccups regarding sleeping arrangements for Sara, a volunteer and myself, but things smoothed out. Sara got to bed at 6:30am after the first night-not the easiest vacation ever. I had a great time, got plenty of sleep, and always had sufficient food and water. I carried an energy bar that Peter took down the JMT and ate half of it. I made a PB sandwich for day two and carried it home. 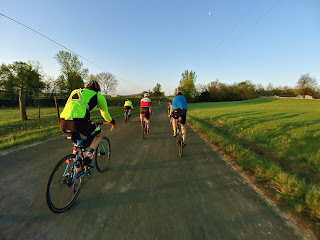 The ride had a nice mix of new and old rando’s, although most of us are over 50. The old randos had a paceline and sang karaoke songs. It was a fairly large group for me, say 8-12 riders, so I eventually abandoned them. There was a joke about whether this was a brevet or a pub crawl. The ride had an international flavor with a rider from the Netherlands, Ireland, and several Canadians. From the US, we had riders from Washington, NJ, FL, CA- all over the US. I am apparently one of the few mortals that rely solely on a cue sheet and wrist watch for navigation, and that was tested when I went off course, thinking it was a cue sheet error. I made a greater attempt to ride with others at night, or be sure others were nearby, after that. It makes me rethink this strategy, although in the end, following is cue is part of what I love about the sport. 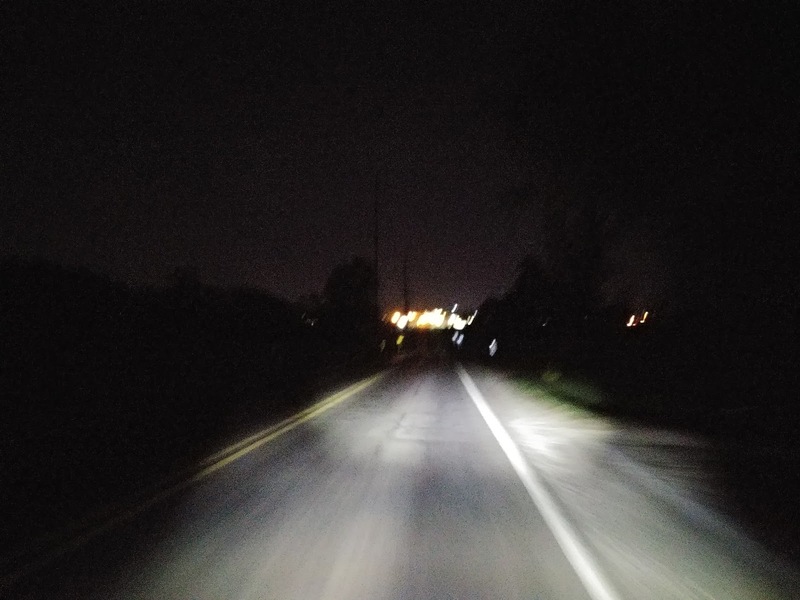 On day 1, leaving Petoskey after dark, by myself, I mis-read the cue and expected to turn at Harbor Springs Airport Road just 0.3 mi from Division, at the first paved road. I had skipped the line about riding another 3.3 miles on the trail. 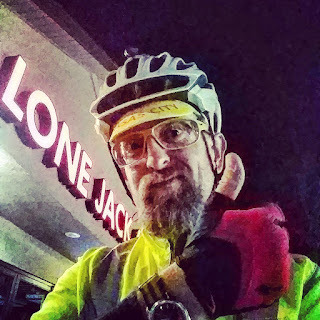 I rode a mile or so, then doubled back. As I passed a park shelter, I heard a voice coming from the darkness. I braked and directed my light towards to shelter and asked for help. From the back of the shelter came an old hippie-looking man, about my age. I asked if he knew where the Airport road was, and he assured me I was heading the wrong direction. (He was right.) 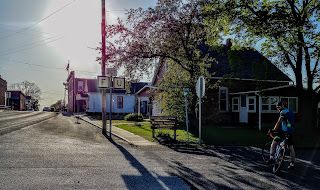 He asked where I was heading, expressing disbelief at the answer, Mackinaw City. Studying the next few lines on the cue sheet, he exclaimed that, no, there was a much better way to get there. 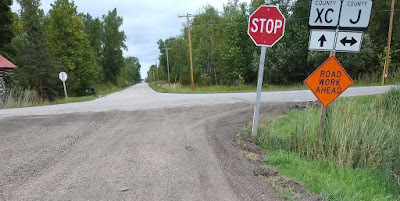 I explained that I needed to follow this route, regardless, but was afraid that I had missed a turn. He then offered to take me up the trail and started walking. “Come on”, he said waving for me to follow. I pleaded that no, it would take forever to get there walking. “Do you smoke marijuana?” he asked. I’m unsure of where this line of questioning could take us. I tell him that I will continue to backtrack until I either get my bearings or encounter other riders, and as I prepare to leave, he asked me to wait and let him give me some lucky stones. Arrayed on the shelter handrail was about a dozen small stones. He studied them intently, then selected these four small stones, and handed them to me. I dropped them into my handlebar bag, thanked him, wished him well and said goodbye. 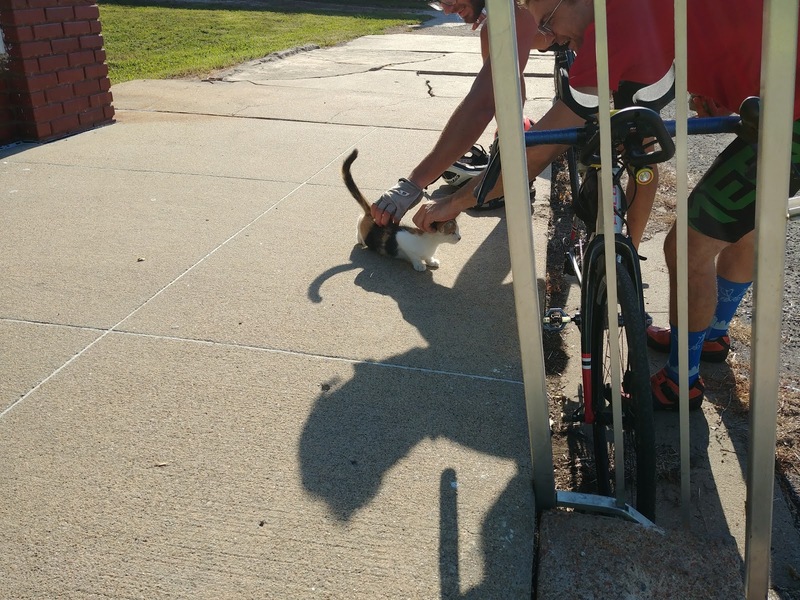 The opportunity to meet new people, even so briefly, is one of the things I love about randonneuring. It’s also why I love to navigate via cue sheets and a wrist watch instead of GPS navigation. River Road, on Day 3, along the Menomonie River, was one of the most beautiful parts of the course. Shady and well paved, with glimpses of the river near sunset. I’m not sure what they have against cyclocross up here. (Stop XC). I was amused about the road work being behind, not ahead. I wish that I had noticed the old log shelter barely visible to the left of the frame when I took this. This red-head was finishing her breakfast when we came down to eat at the Econo-Lodge. Yes, we know most people ate across the street, where they make real food, or around the corner, where they make great coffee and pastries. Let’s just say we are suckers for free waffles, scrambled eggs, and cold cereal. Anyway, I didn’t think to engage this lady in conversation, and she disappeared as riders swept into the breakfast nook. After departure, when we saw her looking back to shore, we recognized her from the motel, but still didn’t approach. Looking back, I wonder what her story could be, why she was travelling alone across the lake. If she had jumped the rail, would anyone have noticed? 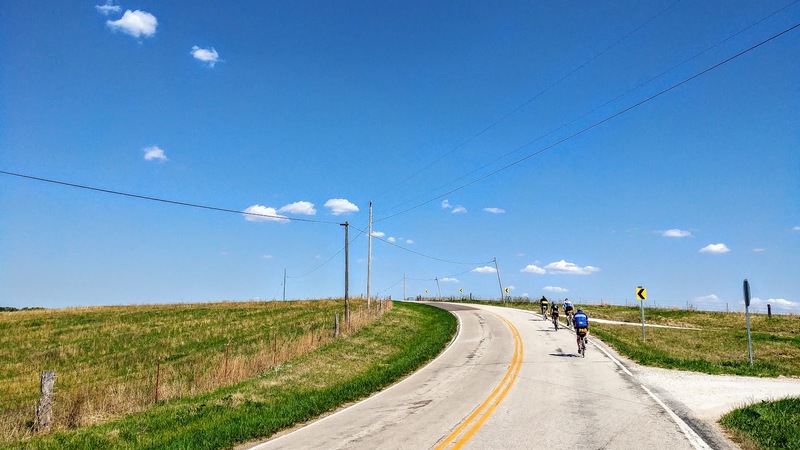 We were swept up in the group of riders, organizers and volunteers, and I never saw her again. Now here is an answer to that age-old question, “Why would I want a bigger yard?” I’ve wanted one of these mowers since I read that that old guy, Chuck Harris from Ohio, who made Harris helmet mirrors, had made one. Genius. I just wonder how many randos stopped to take this picture. 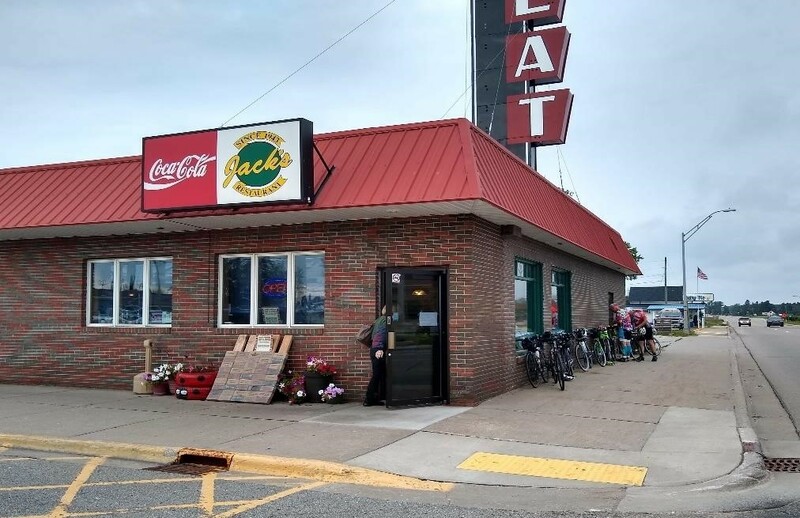 Jack’s, in Rapid River, Day 3, was well placed for second breakfast. 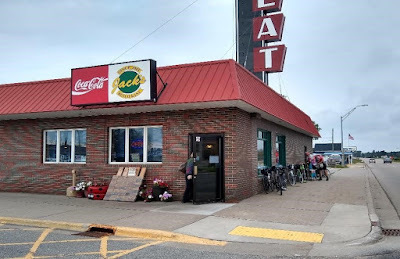 Our neighbor has roots in the Upper Peninsula and recommended this place. It was awesome. As I was getting ready to pay, I spotted some of the largest cinnamon rolls I have ever seen. With frosting. Sorry for no picture. I will be dreaming about these for as long as I live. Can something so large and beautiful still be tasty, in equally excessive proportions? 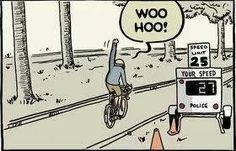 These are things I wonder about when I ride. The last few miles of any long event are always special. Here we were treated to some intense displays of power by Mother Nature. Up by the Nuclear Plant, we were treated to bolts of lightning and thunder, with near-torrential rain. The temps would drop 10 to 20 degrees, then immediately climb back towards 80. Waves of mist would roll towards us. Coming south from Two Rivers, the storm settled out from shore, and as I headed in, I tried to capture the intensity of the waves crashing against the shore. 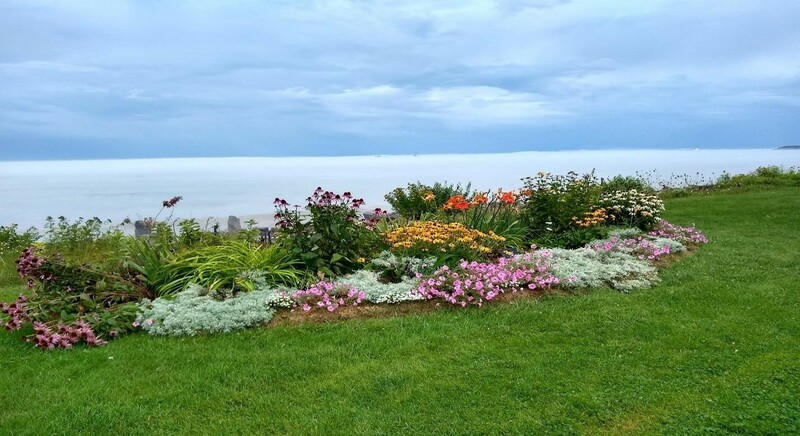 This lake-front trail has a number of well-kept gardens and memorials. I snapped this picture to capture the ship (visible above the flowers) which appears to be going down. I suspect it is really just partially embedded in fog. There were many people stopped along the trail taking pictures of this ship, so who knows? I grew up just a few hundred feet from Lake Erie. This ride reminded me of the power and intensity of wind and water. My sincere thanks to Michele, Jeremy, and the army of volunteers that made this experience possible. Over the next couple weeks I'm cleaning out the hopper and getting some notable rides posted, finally. Enjoy! It's become more and more difficult to find the time and energy to write with my current workload and priorities, so I've not posted much of anything in recent months. Still, I've been trying to keep the riding going and have made some good strides toward consistency and personal health. 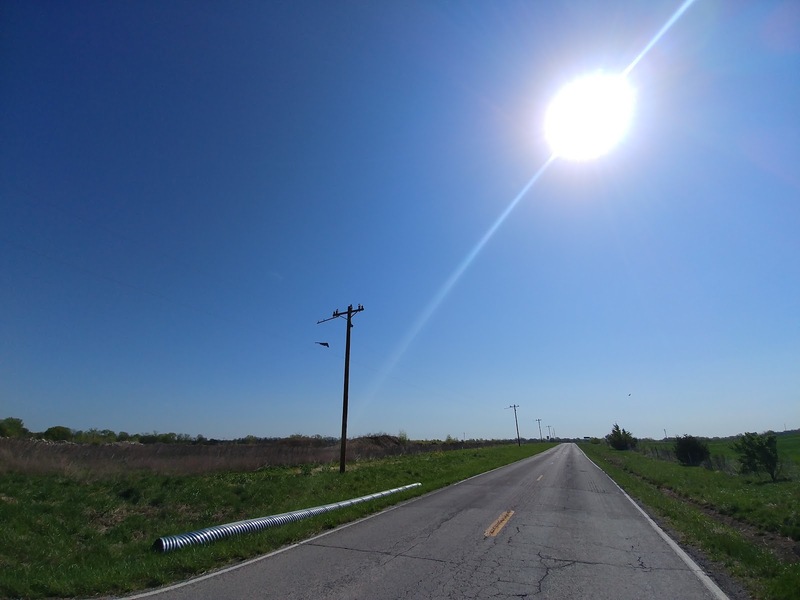 A bit of this post will relate some of those discoveries, and pass on some photos from the 5/5/18 Cole Camp 410km ride that I just decided to "do." I say it that way because, regardless of consistency I hadn't been able to ride a 200km for months. So, I was embarking on a 410km (250+ mile) journey without much base. 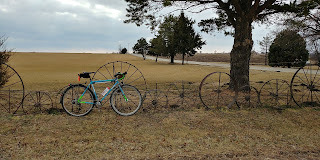 I'd done the 70 miles gravel brevet back in March, and a 90-miler in April, but little else aside from commutes - which, because of my mental hang-up about cold weather which seems to rear its ugly head every February, had been spotty at best. Still … if you don't start, you never will. What could go wrong? Let's jump backwards a few months, first. 2017 was a really good year for cycling. 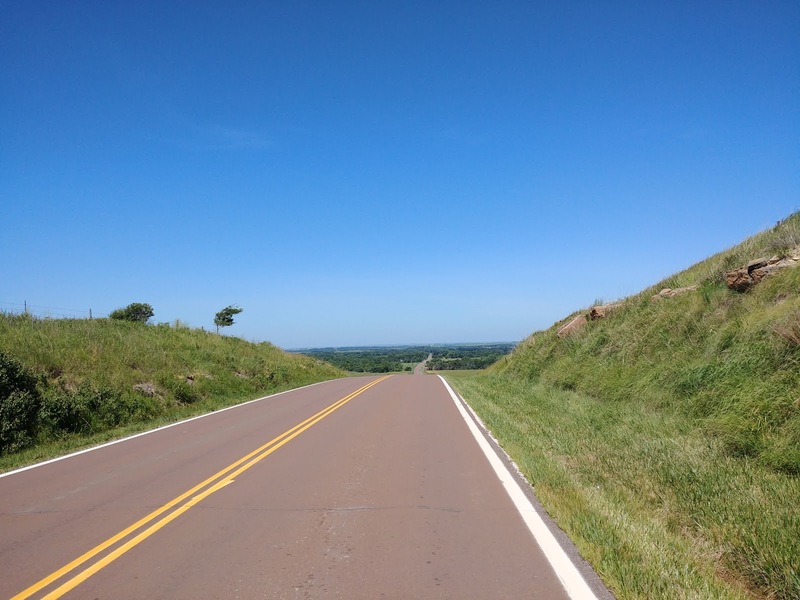 A lot of great rides happened which deserve write-ups, each in their own right, but the same constraints of time-passed, commitments, and mental energy . . . some of it is just "gone," at least for the purposes of these pages. The Fall Dart from last October was amazing. I don't think a single ride I've done has inspired so much change, discussion, and wonderment. People who had participated in that ride came home and built all new bicycles just to be more prepared for the next edition. Really. There's gravel. There's hills. 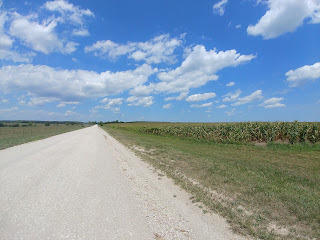 ...and then there is gravel and hills in the Ozark region of Missouri. I was prepared to be amazed, but I had no idea how challenging and satisfying a single 200km event could be. And it was a DNF for our team. I don't think anyone really cared about that. Honestly, it would have been my 12th and final ride needed for my 5th R-12, and even when it was inevitable that the ride wouldn't "count," I never felt an ounce of regret or disappointment. It was simply epic, and it's doubtful I'll ever forget it. People broke saddle rails, racks, there were more flat tires than I care to mention, spirits were broken and repaired, the views were amazing, and the smiles were huge. Less than a week later I jumped back on to the bike, back home on familiar, paved roads, and grabbed the last R-12 installment that I needed to get my 5th complete R-12 run. It wasn't a hassle. That Fall Dart was tremendously rewarding. The planning stages for another Fall Dart in 2018 have begun. You should think about joining RUSA. ...But, after that ride I was pretty much "done" with riding longer distances. I was tired. Adding to this, I hadn't really been treating myself very well, food-wise, which I realize is a long-recurring theme over the last decade or so. This time, while I was managing to remain consistent on the bike, I was developing a bit of the mid-40's male mid-section, and my health markers were not where they should have been, or at least not representative of the level of activity I'd been performing. After some personal inventory, it was time to clean up my diet. I won't talk about the past. I won't talk about numbers. If we end up riding together, and you ask, I'll talk about it -- but not here. Short story, I've managed to get back on track, and I'm eating like a grown-up cyclist again. 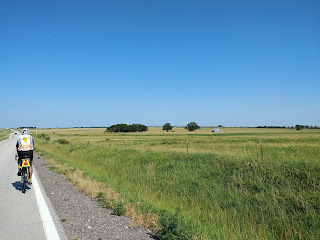 The riding, to say the least, has been pretty good since then, and I've been re-energized for long-distance endeavors again. Still, jumping into a 400km ride without so much as a 200k to stand on for six months seemed a little risky. It's a lot of distance . . . so, most of this will be condensed into photo captions. Honestly, if nothing else.... yes, I will keep this blog going … but, lately, Instagram and Twitter have been really helpful in relating activity in a timely manner. It's hard to be a blogger in this day and age. The times are always a-changin'...as is people's spans of attention. Seriously, look for @rusadude on Instagram. Thanks! 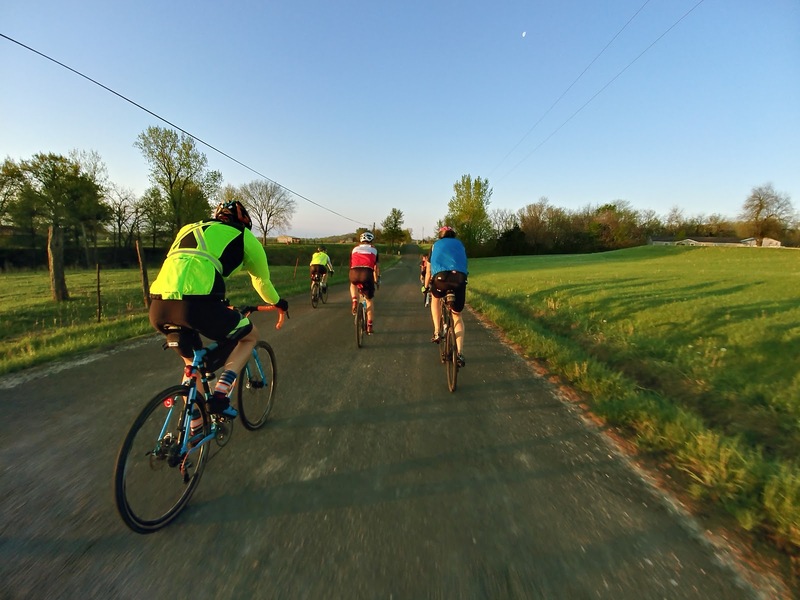 Adam, at left, on the maiden voyage of his new steed, and a smattering of other very talented riders are cutting up the early miles of the ride, back in the fields southeast of Grain Valley, MO. 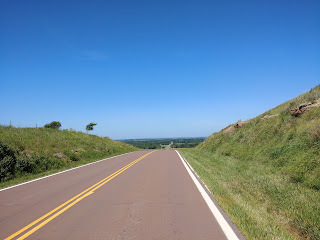 I hadn't been on these roads since riding the Knob Noster 200km permanent, and it was kinda nice how some of the bigger hills felt "smaller." It was also February and quite cold last time I'd been out here, and the finally-warm temps felt good. A lot of these riders had endured a winter that simply wouldn't let go. Only weeks prior, at the 300km event, the expected seasonal temps never arrived and it snowed. The spring had been cold, windy, cloudy, and wet. Finally, the sun had come out on the rando crew. 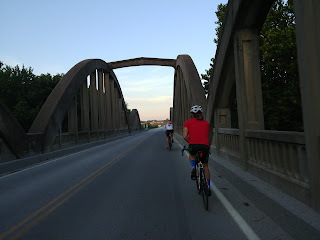 The father-son DelNero duo and Adam heading east on Missouri Route VV, freshly paved and largely traffic-free. Feeling fresh and alive under the early morning sunshine, it was a great day with calm winds. But, as we all know by now, reading this in early July, the sun is different this year. I can't quite explain it. It started to get warmer, and warmer. . . and warmer. With a forecast high only expected in the low 80's, it rose almost 15 degrees above that and began to take its toll on some of the riders. Here, heading east we get a rare treat and flyover from a bit of American super-powered-ness. Yessss…. so cool. 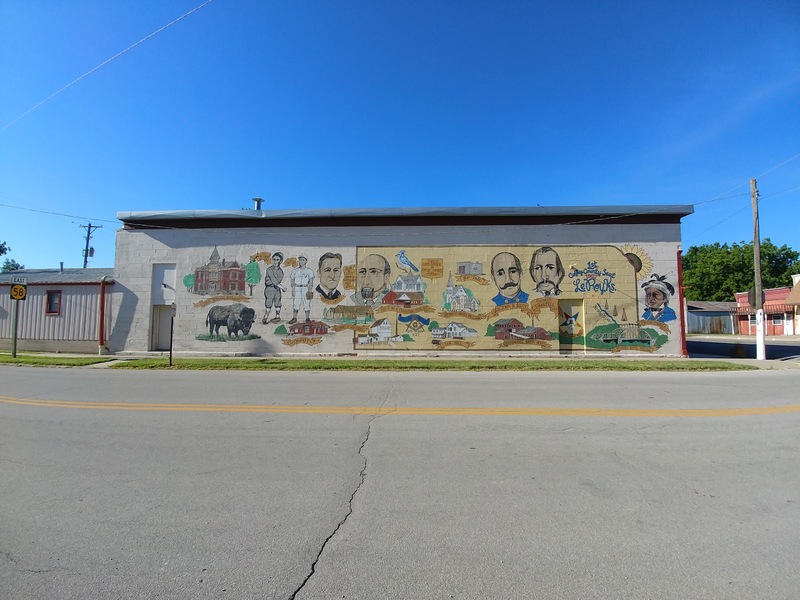 In Sedalia, MO. 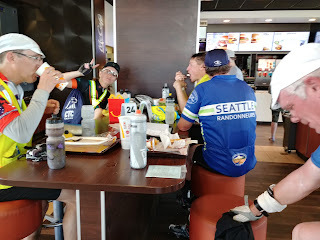 at the jumpin' McDonald's there, KC randonneuring's finest around the table, from the left Gary D., Anda A. (she's a new rider, but already rides like a veteran), Joe E., Rod G., and Spencer K. Much food was consumed. Hydration was quickly becoming a "thing" and without even thinking about my own thirst I downed 4 refills of water in my 20 oz. McD's cup - supplemented with Hammer Endurolytes - while sitting in the cold A/C and eating what I could for the next leg. Under crystalline skies, our group continues east toward the next control. 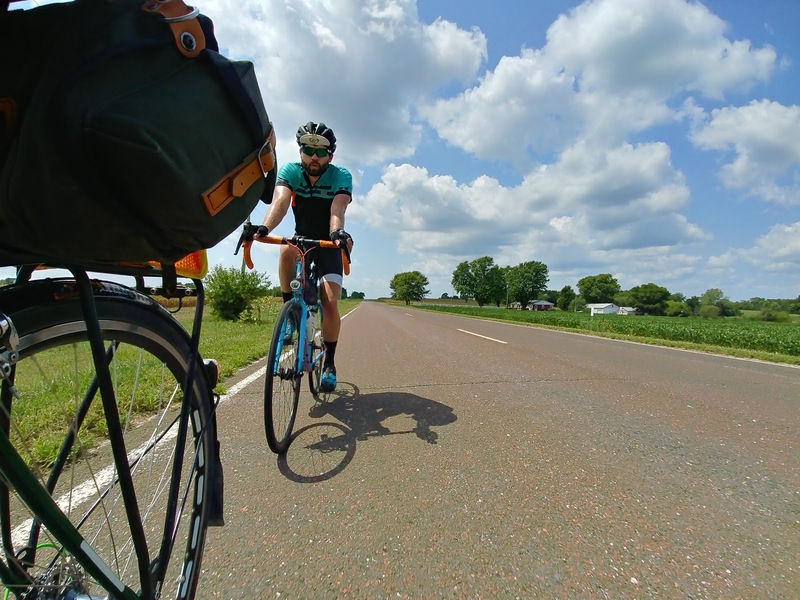 I love this shot - just a perfect post-card of randonneuring bliss in the Missouri countryside. But, it was hotter than most of us had been used to. All I could do was look down at times, as it'd been so bright. Here, I study the details of Adam's new bike and admire the crispness of the shadow the bright sunshine is casting on the pavement. No trees, no shade. 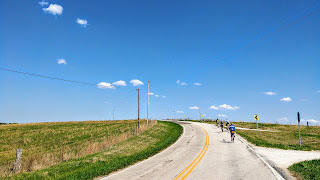 The middle section of the ride started to get into some really scenic country, all new territory for us - desperately pretty, but hilly at times. Combined with the heat of the day, nobody really felt quite perfect at the half-way control, and break times began to increase. The A/C was so cold inside some controls, many began to get chills. Hydrate, and try to eat. Repeat. After a springtime series which seldom allowed riders even the simple comfort of removing arm warmers, the sudden weather shift proved challenging. Finally at Cole Camp, MO. - the route's namesake - we came upon the best Missouri lettered highway marking combination I've ever seen. Well-played, Cole Camp. Well-played. 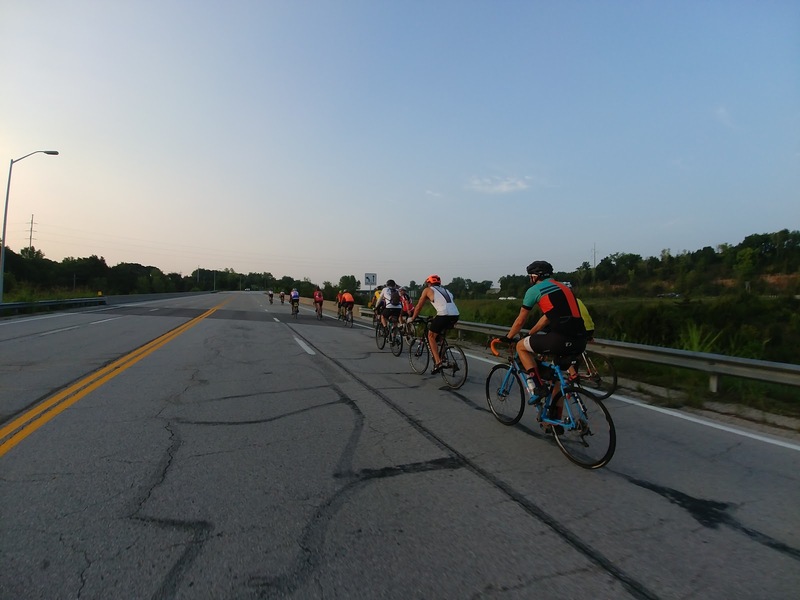 While the state highway department affectionally gave us "the finger", I think the feeling was mutual among some of the riders. Here, after struggling with cramps and nausea, Adam would call it a day. Feeling equally weird, I took an especially long break here as well before continuing. Last on the road, I'd face the final 100 miles alone and in the dark. At least it would cool off a little. Yeesh. Though I do enjoy people's company, years of solo missions and personal R-12 time-trials do pay off sometimes. Nothing but my thoughts and dark country roads, I chipped away at the mileage, hitting Sedalia again, enduring some light rain (which actually felt really nice) in Warrensburg, having the Casey's all to myself in Holden, MO., and then here at Lone Jack, MO., getting jacked for the last - quite hilly - 12 miles back into Grain Valley and the finish. I think it's around 4:00 AM in this shot. Have caffeinated Espresso Hammer Gel, will travel. Let's do this. My camera really didn't handle this request well. Finally, a bright spot in the darkness, I make the final turn and begin the last leg north toward Grain Valley, MO. and the finish, just a few miles distant. Greeted by a lone Spencer K. standing in the motel parking lot giving an encouraging holler, I put my feet down for a 410km finish right at about 23 hours. Not a wicked fast 410km, but, considering the very long stops and rests, it was not a bad day. Thanks to recent dietary changes and a few lost pounds, I felt surprisingly good... almost ready for more. 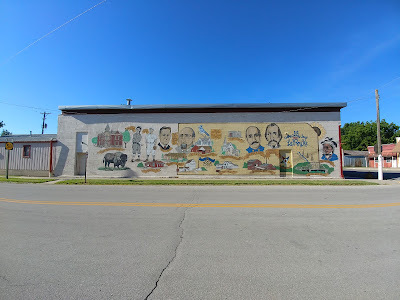 - Lone Jack, MO. (store closed) finished pbj crackers, espresso Hammer Gel for run to the finish! 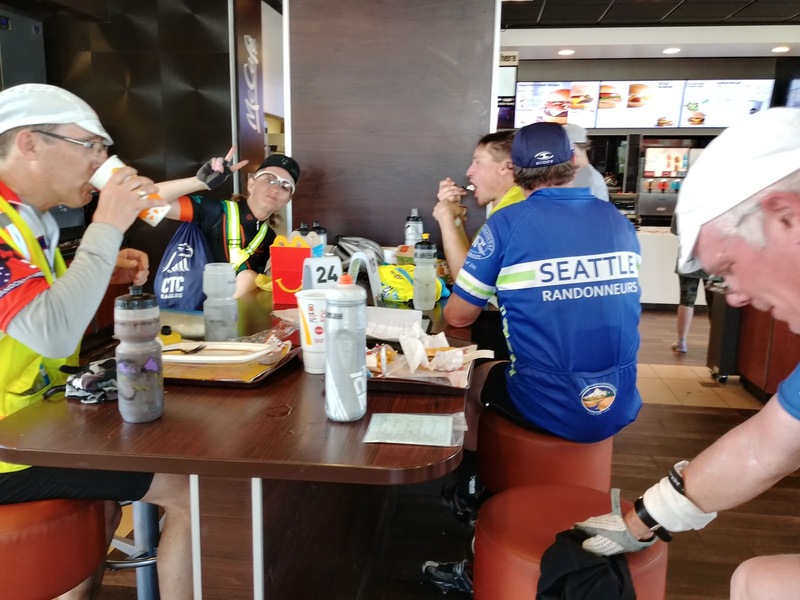 - Immediately after ride, packed car, drove through McD's in Grain Valley, ate in parking lot: egg mcmuffin w/ no cb, 2 hashbrowns, large water, finished remaining ride water/Fizz mix. New 48/38 chainrings up front, true "half-step" front gearing difference seemed to favor more consistent speed and less overall shifting around; sorta favors my overall style of being "single speed" in mindset, but with options. 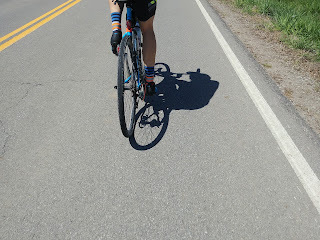 The 38x27 combo was sufficient for even the steepest hills in the Ozarks area, excellent cruising otherwise - right in the middle of the cassette with good mid/high cadence. Shifting from small ring to big ring subtle enough to not "spike" the legs with too much load, no cadence over-runs when shifting from big to small for climbs. 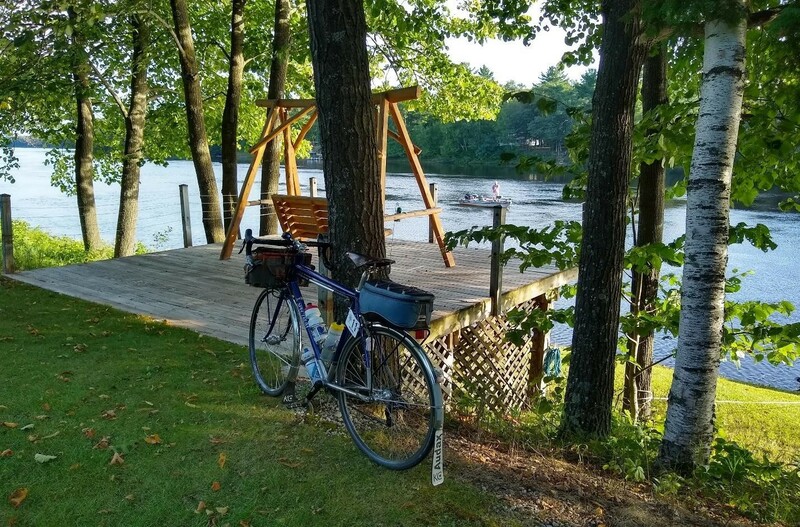 Yup... total knuckle-dragger, I'm running an old lugged steel frame with downtube shifters and 9-speed gearing, 12-27 tooth cog out back, and 48/38 front. Honestly, 48x12 is plenty big... and I still never find myself needing that gear. 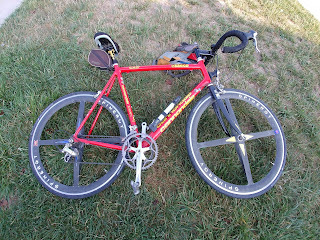 The business-end, however, 38x27, is butter on longer climbs if one keeps the cadence up. Yeah, sometimes I feel like I'd want a true compact gearing setup with a 34 or 36 tooth front ring, but, I just prefer the look of my old Shimano Ultegra 6500 crankset. It fits the aesthetic of the frame. One of these days they will stop making bottom brackets and my hand will be forced, but, I like a certain look. 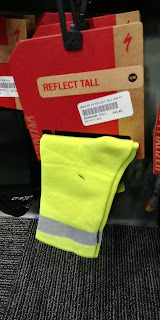 Issues: 2017 Specialized Mtn Sport shoes seemed to create hotfoot issues under balls of feet, but, seemed linked to strap tightness; even with the straps quite loose, it felt like I wanted to loosen them even further. This was with thin wool RUSA socks, nothing excessive. My last, now retired, Specialized Sport Mtn shoes didn't exhibit this effect, so whatever they did with the last model change, my feet don't seem to like it. I miss them, but the heel cup is completely shredded on both shoes, I don't think that's a repairable issue. They fit great and feel great, aside from ruining socks and cutting up my Achilles area... which is a deal-killer. I miss the sandals at times like this. Definitely notice the issue is more apparent when hydration is behind, however... so, maybe it's not circulation? Dunno. Still monitoring and adjusting where possible. Trying to Yehuda Moon the roadside speed camera in Green Ridge, MO. 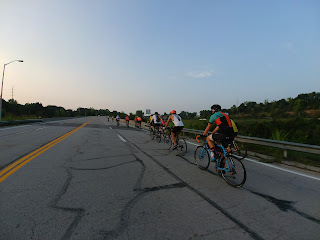 "Hammering" along MO-58 between Kingsville and Strasburg -- feeling FRESH after 225 miles, amazingly, and secret dreams of actually reeling in a rider --- not realizing that they'd all finished at least 45 minutes ahead of me. FINALLY, the last 30 miles don't feel like a death-march, and maybe some of it is the nutrition choices -- on and off bike. Lost 20 lbs since last 200k (as of 5/5/18, referring to Oct. '17 200k), far better diet, no refined sugars, lower calories overall - still eating whatever, but making far smarter choices, more protein, choosing items with as few ingredients as possible, etc. Absolutely NO soda on or off bike is a large component. Stuck with Starbucks canned coffee for any caffeine after dark, water with electrolytes, V8, that's ALL. Nothing sweet, no pastries... while those items do "work" and have in the past, it's the sugar crash that likely creates the death-slog issues I've faced in the past. Consistent energy is far better than quick, flash-fire sugary stuff, for me. The Starbucks canned espresso and cream does have sugar, yes... but, it feels vastly different than when I'd have a can of Coke. Small amounts of protein during ride, not sure if it actually helped, but it can't have hurt: PB crackers, the egg mcmuffin w/ cheese, small amount in the Starbucks dbl shot. No choc milk - thinking the lactose and addtl protein would be difficult, based on past experience. Fig bars were good, the same organic type sold at the Hy-Vee health section. Very tasty, all natural, nothing added. I need to buy some and keep in saddle bag for longer rides, if the stores don't carry them. Very effective and delicious. Great ride.... feeling almost invincible afterwards, like, let's start another R-12 run already! It's never "EASY"... but, after some changes it did feel "easi-ER". Remember this next time a big soda and some peanut M&M's sounds tasty. What I put in my body matters. Guest Post: "Try Something New, Every Day"
Every once in a blue moon I see something come across that just feels like it should hit a larger audience, and this is one of those times. The below comes from last year's Cole Camp 410km brevet out of Grain Valley, MO., from Gary DelNero. I've had the pleasure of sharing a lot of miles with Gary, and he always has a smile on his face. I think it's that positive attitude that - at some point or another, on a hard day like he describes here - pushes the pedals farther than mere muscle. So, with Gary's permission, here's his tale from last year's edition. Enjoy! "Try Something New, Every Day"
Forecast: 100% chance of rain from start to finish... flood watch... highs in the mid-to-upper 50’s (F). 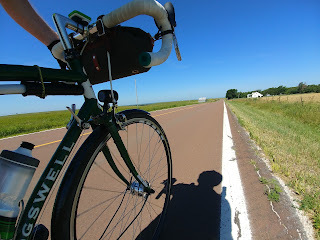 Did I mention 400km - 255 miles? , which I usually do in 18-20 hrs. This was a new route. From Grain Valley into central Missouri. Heaviest rains are in central and SE MO, so we’re safe, right? Saturday AM - text from Paul - he’s bailing. Karen and Greg have also bailed out. Gary Felkner has volunteered to come get us if needed. And he has a boat. I see Dave Matthews at the start. He’s not sure he wants to get out of the car and it’s barely drizzling. Spencer, Rod and Joe are there - they need this ride to qualify for a 1200km ride in California in July. Three guys I don’t know - two from Westport, one from Springfield. We start about 6 am. We roll south, then east to Sedalia, then south west on a loop heading back to Sedalia with plans to stop at Cole Camp for BBQ. 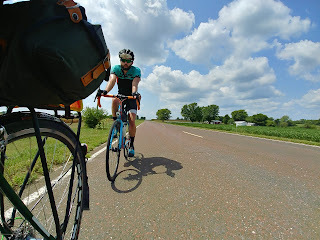 I’m not sure I want to stop for BBQ, so I roll a bit ahead of the group. I’m at the halfway point about 10 ½ hrs into the ride. My Gore-Tex might be leaking. My new rain pants have a semi-functional drawstring waist. Semi- means they fall halfway down whenever I stand on the pedals. I have to sit a lot. Even on climbs…My over-mitts fill with water and feel like water balloons. I’m thankful for every piece of functioning clothing I’m wearing. We’re all shivering a bit at every stop. Quite unpleasant, but not approaching crisis…When pedaling, we generate enough heat to stay somewhat comfortable. We reach a control café at 140 miles in, at about 4 pm. Chatting with locals we learn that our route to Cole Camp is flooded and impassible. Fortunately, this store has a map for sale showing nearby routes. Some debate about options- one way adds only about 6 miles, but the guys seem to lean towards something adding about 16 miles. We really have no idea how many additional miles are involved, and guesses and opinions are varied. The cashier gets a call from a customer who had just left, asking if we would take a ride around the flood in his pickup. We take the offer, then eat while we wait for him. The other guys choose the pulled pork sandwich, so I went with that instead of a hot dog, which I really wanted. I would regret that choice. We start to wonder just when he’ll come back, and whether he really has room for us. He arrives, we load up, and he takes the long route to Cole Camp. We get out of the truck at Cole Camp and head on to Sedalia. This is 85 miles from the finish, and the last likely motel opportunity. We decide to press on, with our next stop in Holden, 50 miles away. I get ahead of the group on a climb, but get very tired/sleepy. Can’t take advantage of the gusty tailwind as we head west. This is why I like to reach a motel by 2 am. Fortunately, no more flooding. On north stretches, I see tree limbs in the road. That was some gusty tailwind! We regroup in Holden, MO. The guys want to take a break and sleep next door at the post office. 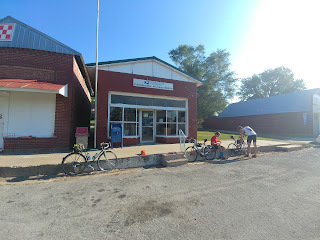 It’s like 3:00 AM - we leave our bikes at the convenience store, spread out in the post office lobby. Two guys have claimed the rubber floor mat and Rod is already snoring away by the time I get there. Spencer is leaning against the wall with eyes closed. I claim a wall spot and close my eyes. Feels good to rest, but I doubt I’ll get any sleep. Jolted awake by a loud, new sound - I think I was snoring! Maybe I shouldn’t sleep sitting up. We’ve had maybe a 30 minute break, but get up, refreshed and ready to roll. The rain has let up a bit. Spencer reminds us, “these miles won’t ride themselves”, and “we’re not getting any closer standing here.” More wisdom than one can imagine. Sleeping in a post office - another first. We head out for the final 30+ miles. The roads start to dry out, but we do encounter some flooding. Water about 6” to 8” deep for several hundred feet. We ride through…it’s not moving very quickly. Then, we began to encounter some fog, but it never got too heavy. We ride on as the sky begins to brighten. We finish at about 6:30am, just before sunrise. The whole day has been cold and wet. Temps never rose above the low 50’s. That little amount of sleep in the post office kept me going to Grain Valley and for the drive all the way home. The other guys will get a few hours of sleep at their motel room nearby before heading home. So 24 ½ hrs, a new longest time for this distance for me. Wettest ride ever. The other guys agree - pretty tough ride. First all-nighter since the ‘80’s. Pretty cool, really. Not something I want to repeat anytime soon, but 600km in two weeks. Didn't I JUST write a post like this? If you're like me ....and if you are, get some help.... the cycling seasons probably start running together as the years pile on from a maintenance perspective (hopefully, not an enjoyment perspective). This is just a part of getting older, and doesn't really apply directly to anything specific; certainly not cycling. If you're under age 35 you likely have no idea what I'm talking about. If you don't have kids, you'll have absolutely no idea. If you're in your mid-20's, for gawdsake why are you reading this website?? Go have a pint or four, watch GCN on your VR goggles, and, if it's before noon, go back to bed. Okay, just kidding... if you're actually reading this, hats off, and thank you. I'm not REALLY a prick... just when it comes to climbing. "I just got this shirt!" he exclaimed, offended, when someone mentions their decade-old shirt and general sense of style might warrant a visit to the Goodwill bin. "But, I just got this lawn mower!" he exclaimed, when the lawn mower he swore he just bought craps-out the spring after it's 20th winter being stored outdoors. "But, I just got these chainrings!" he exclaims, after the chain keeps skipping and he then checks his mileage log and realizes he "just got them" four-score and 20,000 miles ago. This is usually followed by a sheepish "Oh...", and some acceptance. Hopefully. When it comes to things like routine maintenance on a bicycle, everything sneaks up on us. Especially if we invest in good parts which don't require hardly ANY periodic adjustments, we can often forget they're there. But, this is sometimes what lurks in the shadows or in the roadside ditch, waiting to jump up and grab us - usually during an event for which we've been training. This doesn't have to mean a bunch of money, of course. As winter turns to spring, this just invites the chance to "make sure" as you move around your bicycle. Check your headset. How do your cables look and feel? When did you install that cable housing, really? Are your rims okay? Go around the bike with a set of Allen wrenches and give things a quick snug. Torque wrench? Even better! Are those the same tires from last year's SR-series and summer of commutes? Are you really still wearing those socks? (ok, this isn't that big of a deal -- but have you shopped socks lately? Dude.) It is, however, fashion... and I think there's some adaptation of one of the Rules which might advise that if you can't be fast, at least look good trying. Neon socks AND a reflective stripe? OMG YES. Wait.... "look GOOD"... I'm not sure this qualifies. happens to come back around to whatever I happen to already own. All of these things are important, and certainly not limited to the items I've mentioned above. Definitely check all your wear items, maybe re-tape your bars, and if you have any doubts about ANY of it - or, doubts about your own garage skills, give your local shop a visit. For when something DOES go wrong, however, perhaps the best thing you can have are your spares. Spares, however, usually live WAY out of sight and mind - right up until you need them. Your seatbag... framebag, whatever these kids today are running ... the place where you keep your tubes (or plugs and patches?) 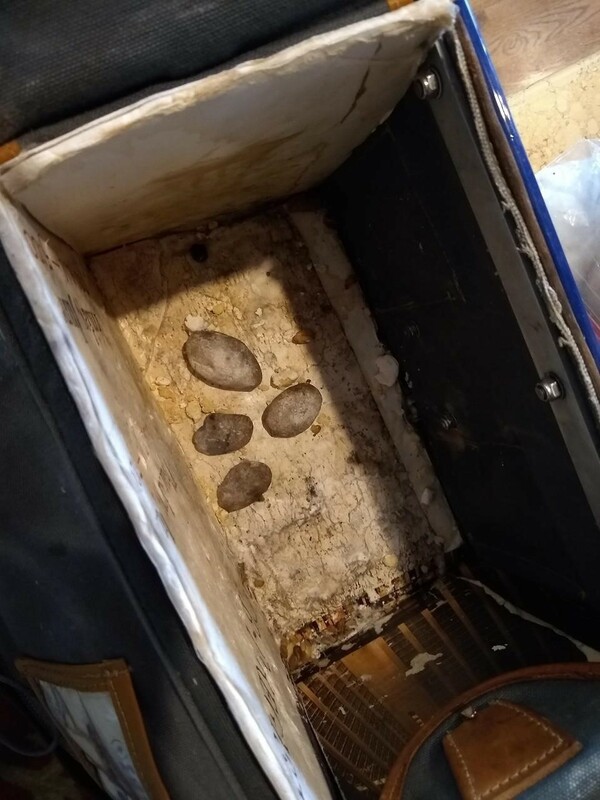 ... your tire boots, small dropper of lube, extra energy gel, .... are they all dried out, stuck together, and utterly useless if you'd happen to need 'em? Well, this is the time to get in there and see what's happened to the contents of your repair kit over the last season and subsequent winter. Even if you rode throughout the winter, chance are some of these items didn't like it much. Even if you're running tubeless, there are special considerations you likely already know to stay atop, like refreshing your sealant -- but, that "just in case" tube you should be carrying might be a rotted and useless hunk of vaporized butyl-powder at this point. This is the time to make sure you'd don't have to make any embarrassing phone calls or rack up $70 in Uber charges if things go sideways this spring on the roads. Check your wheels. Oh, and the ones on your bike, too, probably. SO, yeah... make yourself a list and check everything twice. Fender and rack bolts... if that's your thing. Check your wheels for any truing issues or sidewall wear... unless you run disc brakes, and then you should check your rotors for wear and swap out your pads. Yeah, this isn't an exhaustive list, but you get the idea... you want to be riding for the ride, not the amazing opportunity to exercise your roadside resourcefulness. Well, unless you're into that kind of thing. That's your post for this week... while I can't guarantee I'll be on here any more often than usual, this blog is still very much alive .... if not completely irrelevant to most modern cyclists; unless you ride to work, still happen to like steel frames, own several neon vests, prefer non-GPS cycling computers, rim brakes, tubes, fenders, and riding long distances at a moderate pace with no real training benefit. After all, I just did a race... didn't I? Um, no, dude... you didn't.